Reclaimed lumber is popular for many reasons: the wood’s unique appearance, its contribution to green building, the history of the wood’s origins and the wood’s physical characteristics such as strength, stability and durability. Reclaimed beams can be sawn into wider planks than the harvested lumber and many companies purport that their products are more stable than newly cut wood because reclaimed wood has been exposed to changes in humidity for far longer and therefore more stable, allowing them to be used with radiant heating systems. In some cases, the timbers from which the boards were cut have been slightly expanding and contracting for over a century in their previous installation. 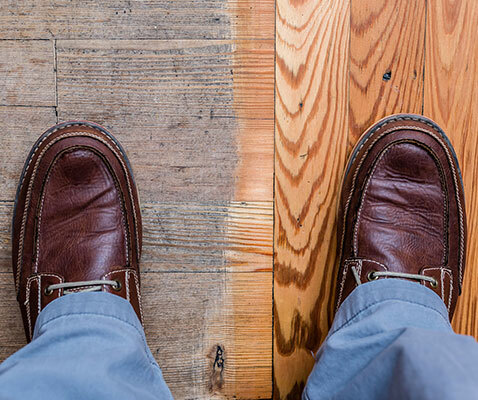 Radiant heat, with its low temperatures and even distribution affects the wood flooring the same way, but the impact is much less dramatic with antique wood than newly sawn wood because antique wood has already been through this cycle for years. There are several reasons why you may be intrigued with using reclaimed flooring for your home, office, or retail outlet. A floor made from antique wood has a unique beauty and defining character that cannot be found in newly sawn timber. Recycling wood is an environmentally responsible alternative to cutting down trees. Reclaimed wood has been transformed by nature and time into something unique that links us to our past. Every one of the reclaimed floors installed and finished by Madera Floors has a story to tell- that you can retell time and time again. Only the most stable timbers were used to build the original structures, supporting them for sometimes hundreds of years; so, you can be confident of the wood’s continued stability in the next phase of its life as a floor.